Once again, the directions weren't clear. 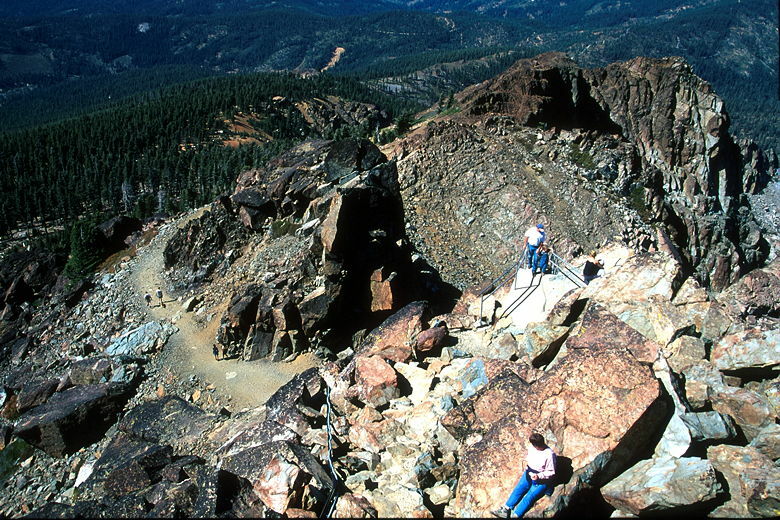 The California Hiking book states that the hike to the top of Sierra Buttes is 5 miles and starts at 6000 feet elevation. We followed the driving directions, but soon found ourselves climbing well above 6000 feet. We turned around as I looked in another book, which described the hike starting at 6000 feet but being 7 miles. Eventually, by analyzing the USGS Sierra City map, I realized the problem. There's a road which climbs to 7000 feet. 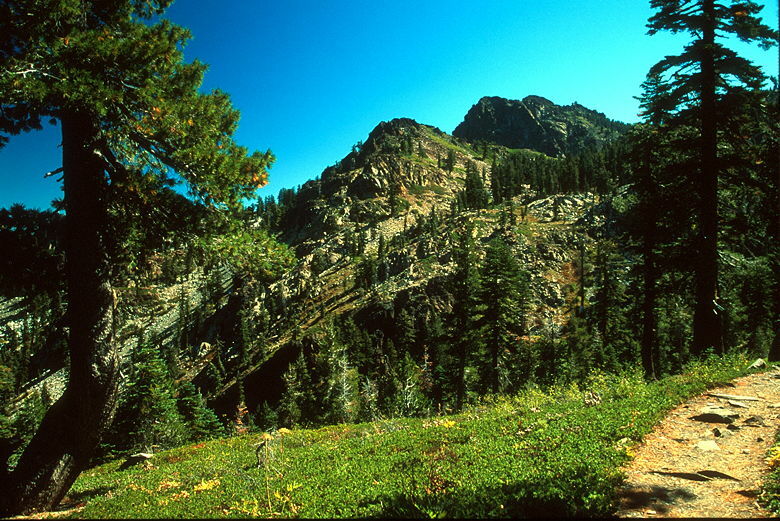 The hike from there starts at 7000 feet and is about 5 miles. The hike from 6000 feet is in fact 7 miles. The California Hiking book mixed the two. So to make a long story somewhat shorter, we drove toward Packer Lake, took a left, went up the winding narrow road to the top, made a left, and parked at the parking lot where the pavement ends. There were several other cars here in the dirt lot, most of them mountain bikers. 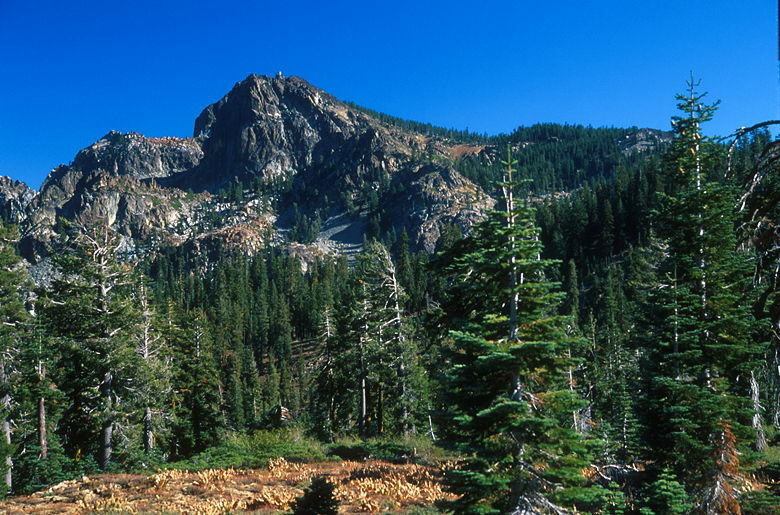 We could clearly see the lookout tower atop Sierra Buttes from the parking lot as we prepared for the hike. We hiked down the gravel road to discover that there's another parking lot by the trailhead about a tenth of a mile down the road. Well, at least we didn't have to drive on gravel. Beyond this lot, the road becomes an off-road 4-wheel-drive road. We wouldn't be walking on the road, thankfully. 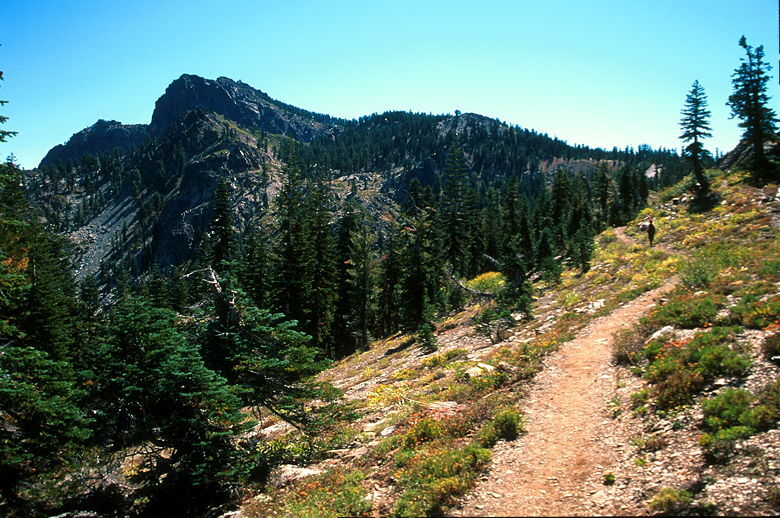 We slipped beyond a gate and started our hike on a section of the Pacific Crest Trail. The trail starts climbing immediately, slowly switchbacking up along a wide dirt trail that's probably a former logging road. In fact, evidence of logging abounds. Some sections of forest are noticeably thinner, and there are patches filled with 5-20 year old trees which were clearly planted to replace the ones that were cut down. It was clear we were hiking in a National Forest and not a National Park. At least there are no visible patches of clear cut to truly ruin the experience. After about 400 feet of climbing, the trail levels out for a stretch. There are views to the west and east. Range after range of mountains stretch off toward the horizon to the west. 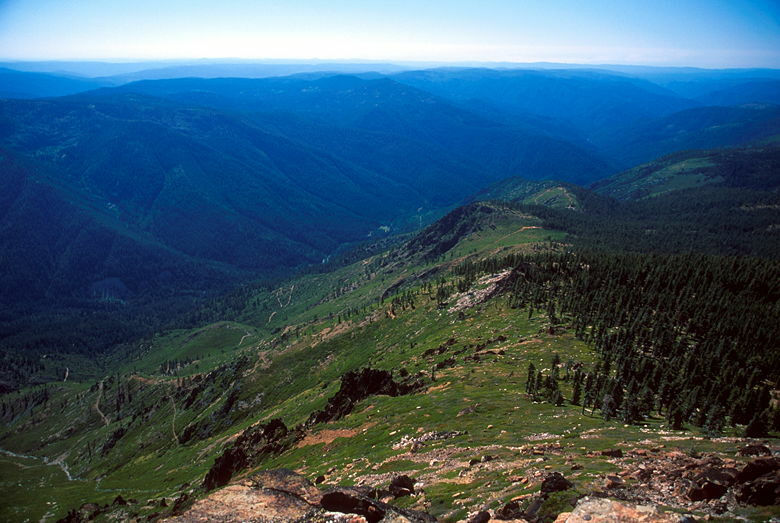 To the east, one range stands tall on the edge of the Lakes Basin to mostly block our view of what lies beyond. The trail skirts the rim above Tamarack Lakes. The two lakes were clearly different -- one was blue, and one was green. It seemed more of a murky green than the clear green of Jennie Lake, however. Soon we reached an intersection with the trail we could have taken from further down, up past Tamarack Lakes. We continued straight on toward Sierra Buttes. As a reminder of all the 4WD roads, we passed a parked car. It had a mountain bike strapped to its back. It was hard to imagine a car coming up the sorry excuse for a road to where it now sat. It would get worse, though. We soon passed through a big dirt parking lot where there were a couple of cars. Shortly beyond that, a huge group of teenagers wrestling with their trucks hopped up with huge tires came roaring up the road to our right. They parked among the trees as we shook our heads and started our final ascent. The trail up to the top was crowded with too many people. To make matters worse, these cheating teenagers showed no respect for the trail, cutting switchbacks and scrambling over rocks apparently just to show each other up. At least I figured they would get to the top and lose interest quickly before turning around. The trail switchbacks up before joining the remnants of the dirt 4WD road, which doesn't appear to be used anymore, or at least used rarely. 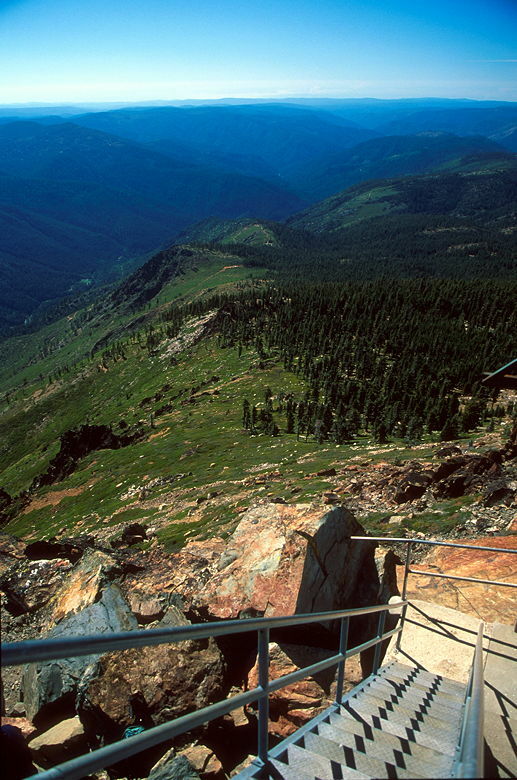 The road then switchbacks up until reaching a large flat area below the lookout tower. Above us were now some of the steepest stairs I've ever seen. Apparently the stairs were constructed sometime in the 1960's. There's a plaque at the bottom acknowledging those who help construct the stairs. I'm not sure if the stairs were replaced at some point, or if they're the original stairs. In any case, they're scary. Much scarier than Half Dome. At least there your feet are always on solid ground. 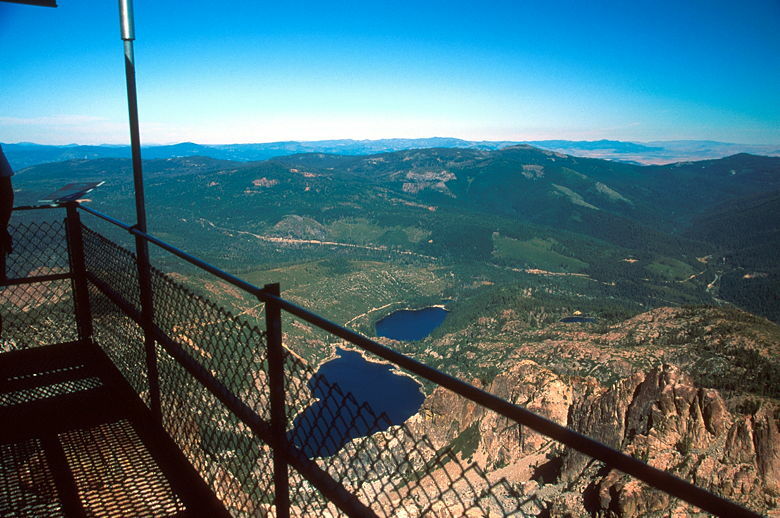 Here, you're standing on a metal staircase suspended 20 feet above the ground, with a precipitous fall of 1000 feet on one side, and another drop on the other. We tucked our trekking poles away to free both hands to hold onto the railings. There are three staircases, totaling about 60 vertical feet. 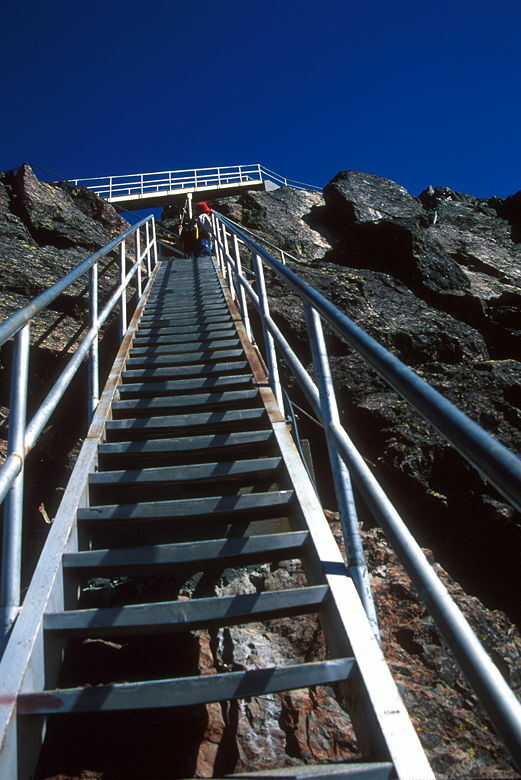 Eventually we made it to the top and then made our way up another 10 feet of stairs to the top of the lookout tower. 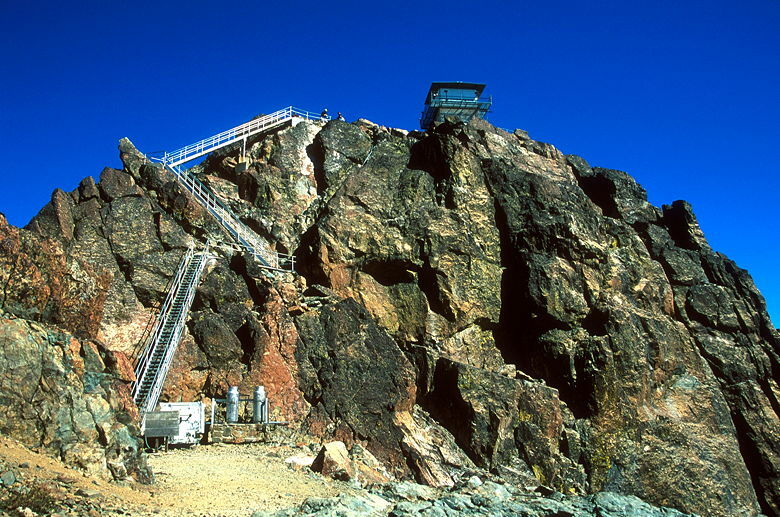 The tower is about 12 feet to a side, with metal walkways all the way around. The whole structure shakes noticeably in the howling wind at the top. Jean stayed up for just a minute or two before heading down, while I stayed and took some photographs. Eventually I retreated to solid ground and we enjoyed the views while eating lunch. Soon enough all the teenagers left and we had some peace and quiet. It was just us and the howling wind. 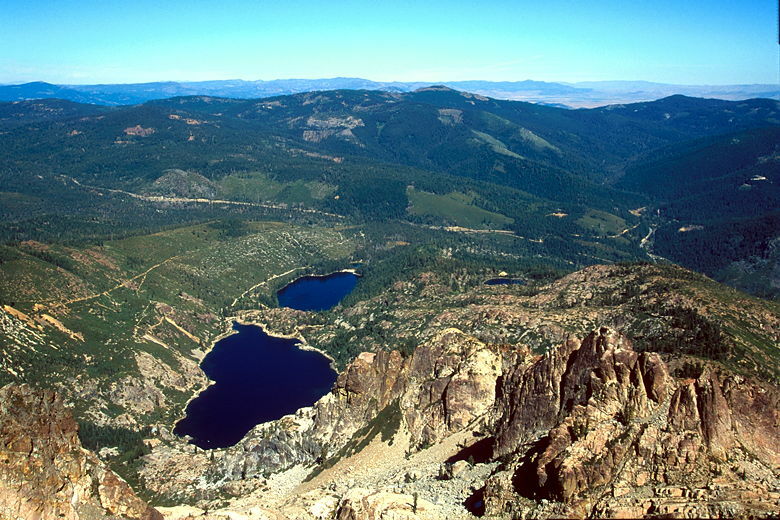 The views from Sierra Buttes (elevation 8591 feet) are nice, with green hills sloping down on the south western side, the rest of the rocky Sierra Buttes spreading south east, and Sardine Lakes below us to the north east. There were even still patches of snow on the slopes above the lakes. The rest of the Lakes Basin is visible stretching out beyond the lakes. After lunch we headed down the staircase. I freaked Jean out by descending with one hand holding my camera, one hand holding the railing. I had a vise grip with that one hand, though. After we reached the bottom we ran into some people who were planning to rappel down one of the rock faces at the top. The trip down was fast. We zipped down the switchbacks, passed a couple cars still sitting in the dirt parking lot and continued past the now-empty spot where there'd been a car with a mountain bike. It was nice having the trail to ourselves again. Soon enough were were back at our car. The same mountain bikers we'd seen at the lot in the morning were there now, back from their day of biking. Now that the sun wasn't shining directly behind the Sierra Buttes, I took some photographs of it from the parking lot. All in all, a good hike which would have been much better if it weren't for the 4WD road. A nice hike, but as long as that road's still there, I don't think I'll do this hike again (which isn't saying much, since the only hike I ever repeat is Mount Tallac).